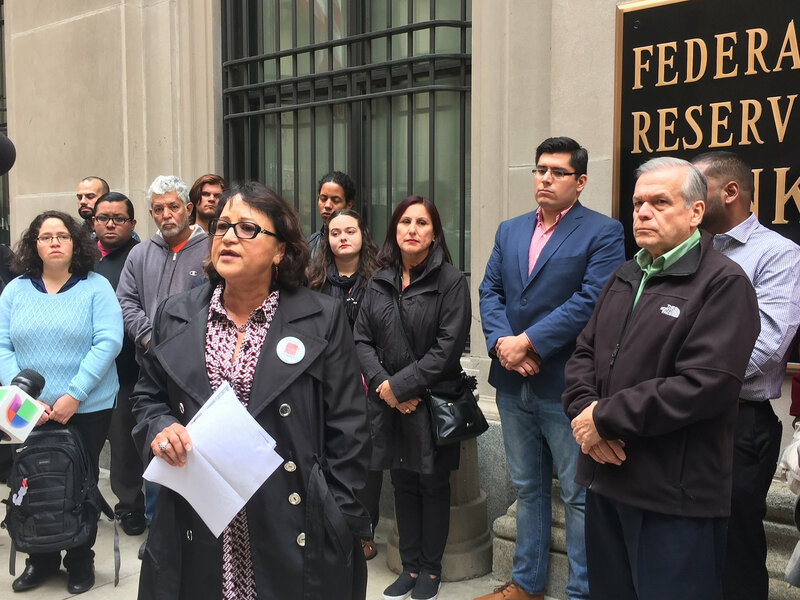 Community groups, members of Chicago’s Puerto Rican community, religious leaders, and union members made a joint statement on Thursday, October 1, decrying the predation of financial institutions on Puerto Rico’s public services and residents, and calling on the U.S. Federal Reserve Bank to step in and offer Puerto Rico assistance similar to that which was given to big financial institutions over the last decade. The Federal Reserve must recognize that the people of Puerto Rico have given up enough and take action. It’s time for us to bail out the people and demand that the banks sacrifice for a change. From Humboldt Park to San Juan, big banks are robbing our children’s futures so they can make a profit. Puerto Rico owes billions in public debt that it cannot afford to pay, debt mostly accumulated under a conservative government that implemented cuts to public services, privatization, deregulation, and other harmful neoliberal policies. The island’s status as a commonwealth to the U.S. has hampered its ability to pursue independent fiscal policy such as increasing taxes on corporations, and as a result the government addressed budget shortfalls by selling more and more debt to predatory lenders. Earlier this year, a group of hedge funds that specialize in investing in “distressed-debt” released an advisory report for how Puerto Rico can manage its crisis. They called on a severe program of austerity, specifically calling on deep cuts to education spending so that bondholders can be repaid. Despite the closure of hundreds of public schools in Puerto Rico over the last several years, the report highlighted increased education expenditures as enrollment fell over the last decade as proof that the island had plenty of room to increase efficiencies to pay hedge funds. But a report commissioned by Puerto Rico’s own Government Development Bank, the official bond issuer, is not too different. The “Krueger Plan,” conducted by former IMF officials, also calls for a series of austerity and anti-worker measures, including lowering the minimum wage, slashing Medicare and Medicaid, restrictions on overtime pay, and cutting government. While the banks want even more austerity, they continue to siphon funds away from our schools. The city of Chicago and CPS are paying $1.2 billion to Bank of America and other Wall Street firms because of predatory financial deals. These toxic “interest rate swaps” are taking public money and putting it straight into bank profits. The Chicago Teachers Union stands with the people of Puerto Rico in their struggle for a just solution to this crisis and for an economy that values the people over profits. boycott BofA, broke on purpose, people over profits. Bookmark.